Defensive board by Fogg converts to her own layup at the other end. Fogg has 8 pts. USD 45, FGCU 38. South Dakota leads 45-38 #WNIT at end of third quarter. 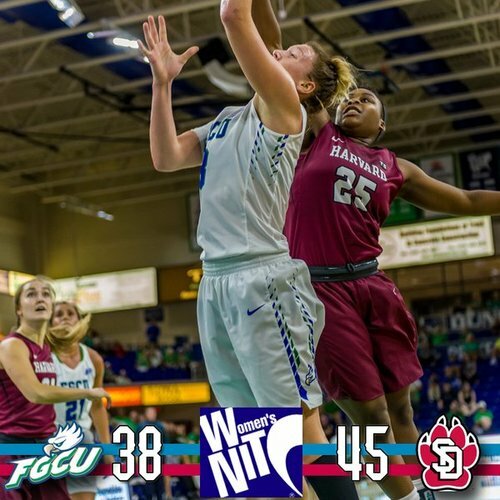 FGCU's Whitney Knight has 8 blocked shots; WNIT record is 10. 8:17 4Q == Knight called for 4th foul on what looked like a tie up. Hemiller with a 3-point play gives USD a 48-43 lead with 8:10 to go in the 4th. Dunson commits 4th foul. Hemiller going to the line for 3 FTs. SD up 48-43 with 6:43 left, chance to go up more. Hemiller makes all 3. She has 15 pts. USD 51-43 with 6:43 to go in the game. Atwater with a 3-point play and follows with a long-range make!! Eagles down 51-49 with 5:40 to go! 4:19 4Q | South Dakota 56, FGCU 51. Media timeout. Stewart for 3! Assist by Seekamp. USD 56-51 with 4:24 to go. South Dakota gets a 3 from Stewart, pushes lead to 56-51 over FGCU in fourth quarter #WNIT . 4:18 to go in regulation. 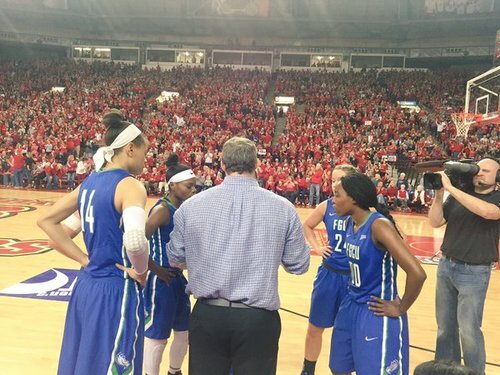 Kaneisha Atwater has scored 8 straight to keep FGCU in game, and she's at FT line. Prompting USD fan behind me to mutter "I hate her"
Atwater hits both. USD up 56-53 with the ball. Seekamp for 2. Assist by Hemiller. That's her 5th assist. USD 58, FGCU 53 with 3:50 to go.